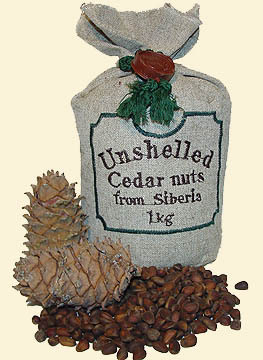 Cedar nut nuclei are rich in valuable mineral substances and micronutrients. The food value is confirmed by the chemical composition of the Pine Nuts. They surpass all other nuts as well as oil seeds in terms of phosphatidic content. As the richest source of lecithin they are comparable only to soybean. 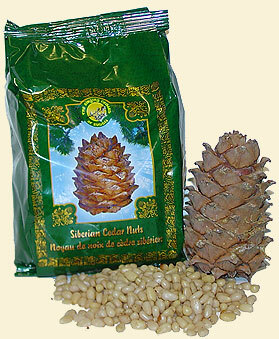 Pine Nuts are also a rich source of iodine, which is very important to residents of northern latitudes. Earlier the husk and powder of the Pine Nuts were used to prepare cleansing baths; particles of bran were also added. The bath had a most beneficial effect on the skin, especially chapped or coarsened skin. These baths were recommended in the case of diathesis, eczema, pyodermatosis and other skin diseases. In addition, a bath with the addition of a concoction made of cedar nut husks and powder has a calming action on the nervous system. It is effective in cases of overexcitement as well as overexhaustion. A potion made with whole Pine Nuts was used for treatment of rheumatoid arthritis and gout, as well as in metabolism disorders and vitamin deficiency. They would pour vodka on ground nuts together with their shells. After letting it steep for 7 days, they would filter it and ingest over a period of 1.5-2 months. The ground nuclei of Pine Nuts with honey was useful in treating ulcers. Folk medicine held that with a variety of skin diseases, including skin cancer, eczema and boils, the constant use of natural Pine Nuts or cedar oil would lead to recovery.